• Multi-function usb conversion plug, dual USB design, apply for a variety of devices. 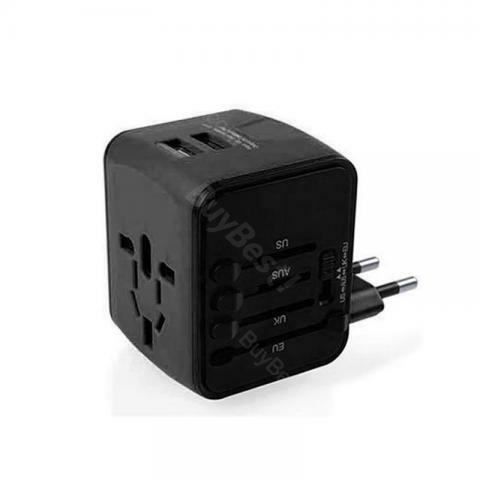 • Combined with multiple national socket holes, can accept different plugs around the world. • Built-in comes with LED power indicator, plug lock system, over-current (overload), high-temperature, short-circuit and surge protections. • Compact and lightweight, easy to carry, unique plug interface design, to avoid accidentally plug the plug and cause leakage, security. • The use of fire-retardant insulation materials, more secure and reliable built-in ceramic fuse, to protect the use of absolute safety. • Built-in high-performance IC charging, can protect mobile phones electrical safety and ensure the quality of charging. Bought for a trip to Ireland from the US. Worked great. Having the two USB ports on the side was a great benefit. My wife and I were able to plug in our phones and then use the main port for charging the laptop or camera batteries. Doesn't down-regulate voltage but that is clearly spelled out on the vendor page. Nearly all modern manufacturers of electronic equipment are completely voltage agnostic so that didn't matter to me. Obviously if you are using a motor induction type of appliance and expecting this to work on higher voltage systems, you've been warned! It works perfectly fine and gives you the 'advantage' of having 2 outlets, 2 USB connections and the usb-b port to charge up all your gear. It really IS great. Prior to going on my international trip, I had not thought having any charging issues. But things changed immediately when I attempted to charge both my camera battery and phone at the same time. Things got tricky. Since I got a new job which requires 50%+ of traveling, therefore this little gadget would be super beneficial to me. This plug has all you need when you are on the go and anywhere you go, this can serve you very well! I’m really glad to get this universal plug. The plug is quality made too, it’s not a cheaply made item! Good for travel especially if your mobile phone supports wireless charging.